I ordered these pretty little ponytail holders from The Magpies Nest last week and they arrived over the weekend. My only regret is that I didn’t order any more! These are fabric-covered buttons on metal-free ties. They came neatly packaged in cellophane, and she also included a little personal note. She wrote on a hand-stamped manila tag with a little bird’s nest and topped off with red and white polka dot ribbon. She kindly included some extra business cards, which I requested. 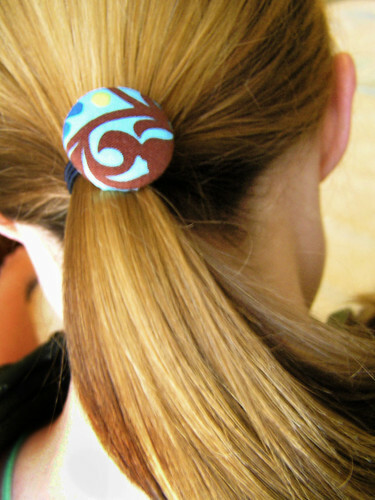 The artist, Renee Thompson, also makes hair clips, bobbie pins and hair accessories for little girls. 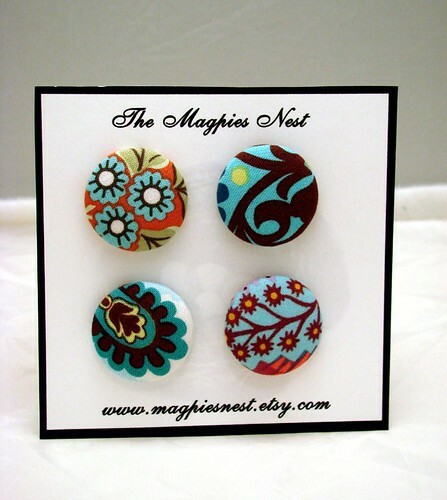 If you’re looking to dress up your ‘dew, I would highly recommend The Magpies Nest!